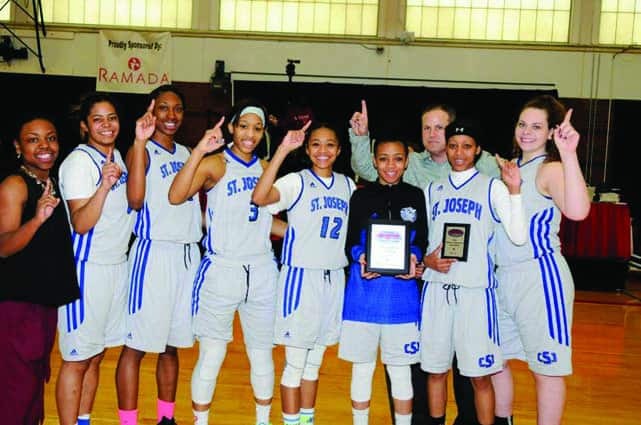 The CSJ women’s basketball team were champions at the Yankee Small College Conference Tournament. RUTLAND — It was an eventful week in sports for College of St. Joseph, as the men’s and women’s basketball teams traveled to Central Maine CC to play in the Yankee Small College Conference Tournament, and the baseball and softball teams headed down south to get each of their seasons started. The Lady Saints basketball were able to come away as YSCC champions for the second year in a row. Mookie Kennedy was awarded MVP of the tournament, while Regina Steele earned YSCC Outstanding Defensive Player. The men’s team came up just short, losing in the semifinal round by only three points. Women’s Basketball went 3-0 in the YSCC tournament, earning them their second conference championship in a row. They had to get through Maine Machias, Southern Maine CC, and University of Maine at Augusta in order to earn the title. It was not an easy task, especially in the championship game, which ended with a final score of 59-52. After a year of dominating performances, this was one of the closest games the Lady Saints played all year and they were led by the lethal scoring of tournament MVP Mookie Kennedy. She had a game high 23 points to help her team withstand the UMA Moose. The men’s team was not as fortunate, losing in the semifinal round to underdog Maine Machias. The Fighting Saints had defeated Machias in both their regular season match ups, but were unable to make it happen again in their third meeting. It was a close game that came down to the very end, but the Clippers were able to just make a few more plays down the stretch to help ensure the victory. The baseball team headed to Louisiana to play at Delgado Community College on Feb. 11. It was a tough test for the Saints, as they were to play six games in four days against great competition, after not playing on an actual baseball field since last October. CSJ made all the games close and came out with one comeback victory against Pensacola State 13-12. They then traveled to William Carey University to play a doubleheader on Feb. 16. They split the pair, winning the first game 4-1. The baseball team finished their long road trip on Feb. 17 against Loyola University. They lost their first game in a tightly contested matchup but were able to redeem themselves in a 2-1 victory against Loyola and headed back home on a strong note. Lady Saints softball traveled to Florida this past week to get their spring season started. They have also not been able to play on an actual field since last fall, and had a lot of rust to shake off. They started with a doubleheader against Webber International University on Feb. 17. CSJ had a tough time finding their bats and lost both games without scoring a run. The next day the Lady Saints took on Keiser University. Once again, CSJ could not find any rhythm offensively and were held scoreless in two games.